Seeks capital appreciation through investment in small-cap value companies. The Oberweis Small-Cap Value Fund seeks to achieve its objective by making intermediate and long-term investments in domestic, publicly-traded equity securities of small capitalization companies. The Fund primarily invests in companies based in the United States with market capitalizations of up to $5 billion. *On October 2, 2017, the Cozad Small Cap Value Fund was reorganized into the Fund, and the Fund adopted the performance history of the Cozad Small Cap Value Fund’s Class I shares. Performance shown before October 2, 2017 is for the Cozad Small Cap Value Fund’s Class I shares. The Cozad Small Cap Value Fund acquired all of the assets and liabilities of the Cozad Small Cap Value Fund I, L.P., from its inception on September 30, 2010, in a tax free reorganization on July 1, 2014. The gross expense ratio of expense off set arrangements and expense reimbursements was 1.35% for OBVLX. Oberweis Asset Management, Inc. (OAM), the Fund’s investment advisor is contractually obligated through April 30, 2019 to reduce its management fees or reimburse OBVLX to the extent that total ordinary operating expenses exceed in any one year 1.30% expressed as a percentage of the Fund’s average daily net assets. The annual expense ratio will reflect a blend of both the old and new expense reimbursement arrangements in effect for 2017. Our process rests on our firmwide commitment to uncovering and capitalizing on the persistent and recurring stock pricing inefficiencies in small-, mid-cap, and emerging-growth equities caused by a lag in investor response to new information. This lag in recognizing the catalysts likely to positively impact future earnings growth drives the security selection across all our strategies and mutual funds. The criteria used within each product, however, can differ. 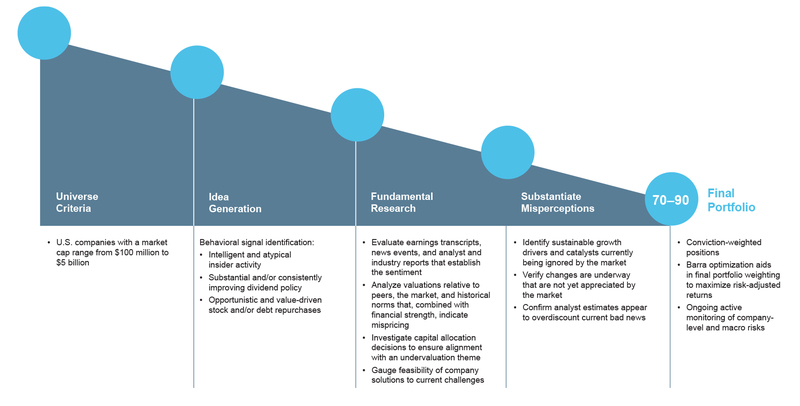 This is how our investment team implements our philosophy in the Small-Cap Value fund. The Russell 2000 Value Index is an unmanaged market capitalization-weighted index of value-oriented stocks of U.S. domiciled companies that are included in the Russell 2000 Index. Value-oriented stocks tend to have lower price-to-book ratios and lower forecasted growth values.